At war with humidity? Win the battle with our secret weapon. Its a blistering 92 degree day and even though you want to stay indoors and enjoy your central air and Netflix you have to be a productive member of society. Begrudgingly, you begin the disheartening task of styling your hair even though you know as soon as you walk out the door, BOOM, your mane is an instant giant frizz ball of mass destruction. Ah yes, humidity, every women’s worst nightmare and every guys worst wing-man. You hear word about new products guaranteed to tame and calm down locks all the time, but do they work? Nope. But what if one could walk outside and have silky, shiny, beautiful hair despite mother natures wrath of fury during the summer months? Sounds too good to be true doesn’t it? Well guess what, its not! 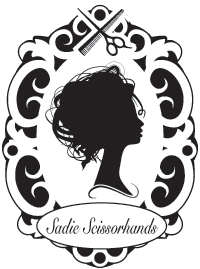 Here at Sadie Scissorhands we have unleashed a secret weapon that can combat any and all bad hair days for good. I introduce to you all our Keratin treatment. This is a treatment that, unlike others, would actually repair the hair, work on all hair types, leave the hair silky, shiny, smooth and manageable while still allowing you to have control of the amount of volume and curl. It leaves no line of demarcation, has accumulative results, and you do not have to wait three to four days before washing or styling their hair. It will reduce your styling time by half which is awesome for those early mornings. If your hair is wavy this will make your hair appear naturally straight and healthy. If you hair is curly, it will minimize frizz and loosen the curl while creating radiant shine and leaving your hair silky smooth. The results will last anywhere from 3 to 5 months. Keratin is a protein and will be infused into your hair and will dramatically improve its condition. Also, its a chemical free process, we love that! 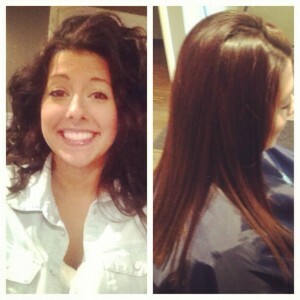 Here is one of our before and afters on our lovely client Alex. After the treatment her hair was straightened just from a blow dryer, no flat iron required!! I do not even think there are enough words to accurately describe the profoundness of this treatment. Seriously. I have no words. You’re are just going to have to experience it for yourselves or talk to our many,many, many (did I say many enough times? I didn’t think so either) many clients who swear their lives by it. There are still plenty of summer days ahead so call us and schedule your treatment right this second!! Beat mother nature and be the envy of all your friends, family members, neighbors, and even strangers.